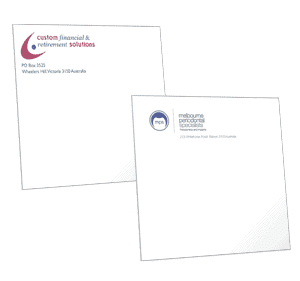 Quality custom branded envelopes will give your off line communications that extra special finishing touch. 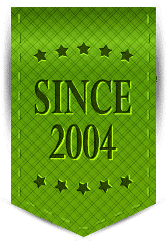 They are a valuable but often under utilised marketing and sales tools that should be within every businesses marketing and sales tool kit. What are the common Australian Standard Envelope Sizes? DL Envelopes: (220 x 110mm) This is the most common size and is designed to hold A4 sheets of paper that have been folded into thirds. 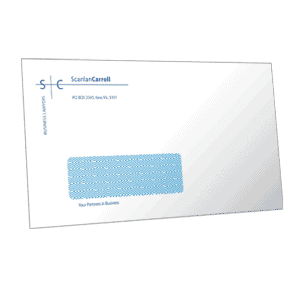 The variants to the standard DL envelope include DLE envelopes and DLX envelopes which are slightly larger and are mainly used in high speed automated mailing operations. 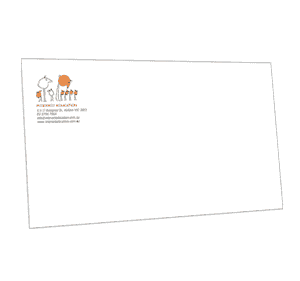 C5 Envelopes: (162 x 229mm) This envelope size is commonly used to hold small larger greeting cards and A4 sheets of paper that have been folded in half. C4 Envelopes: (334 x 229mm) This envelope size is commonly used to hold booklets and A4 sheets of paper that haven’t been folded. You can go online and modify your envelope details and receive an immediate proof. With just a little practise you will have your envelopes proofed and order placed in minutes. The platform’s inbuilt workflow will facilitate internal signoffs and approvals at the click of a button. Your envelope order can also be shipped direct to the employee no mater where they are located anywhere in the World. This saves double handling, time and freight costs. The online envelope ordering platform reduces Intertypes time and costs. These savings are passed onto you by way of lower prices.